2 weeks from 12th March 1966. Detail : The Beatles tenth official E.P. In 1964 an E.P. had been planned (it was even issued a catalogue number) which was going to contain the "Gold Discs" up to that point. One year later and this E.P. was the result of that planning. How do we know ? ... because first pressings actually had "Golden Discs" on the label ! !, although not on the cover. After the first batch had been pressed, EMI quickly spotted their faux pas, and reverted to the correct title on the cover AND the label. This of course, makes copies from that first batch quite collectable. The release of this E.P. was obviously aimed at extra business of the Christmas market, and contained four of the five million sellers up to that point in time. The fifth being "A Hard Days Night". 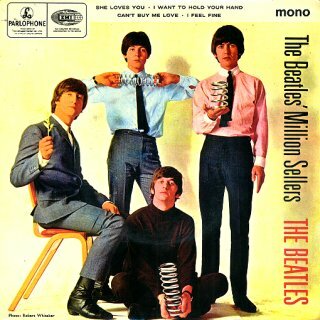 Just fourteen days after this release, they received their sixth U.K. million seller, for "Day Tripper". 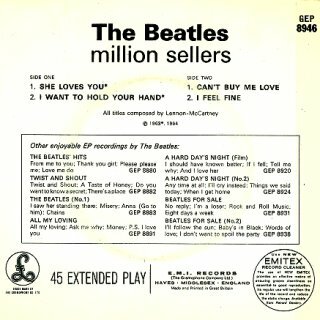 At the time of this release, the combined sales of the four singles it represented had exceeded Five and a quarter million. Even more phenomenal is that the total world sales for these for singles (at this time!) was over 27 MILLION copies ! The E.P. was released in a picture sleeve with a photograph by Robert Whitaker. First pressings had the "Golden Discs" label reference, with around the edge of the label, the words stating the rights of the publishers starting with "The Gramophone Co. Ltd." and across the press-out centre the words, "sold in U.K. subject to resale price conditions, see price lists" are present. Second pressings were the same except the label correction as mentioned above.